Dawn-Lyen Gardner (back) as Imogen and Kenajuan Bentley (front) as Iachimo. Photo by Jenny Graham. Courtesy of Oregon Shakespeare Festival. The Oregon Shakespeare Festival usually plays a similar selection of Shakespeare plays every year: A big, attractive tragedy, a comedy or two, and an apocryphal history or problem play. Though Cymbeline is classified as a comedy, it possesses little of the comedic elements of Midsummer Night’s Dream, and current scholars prefer to classify it as a romance. 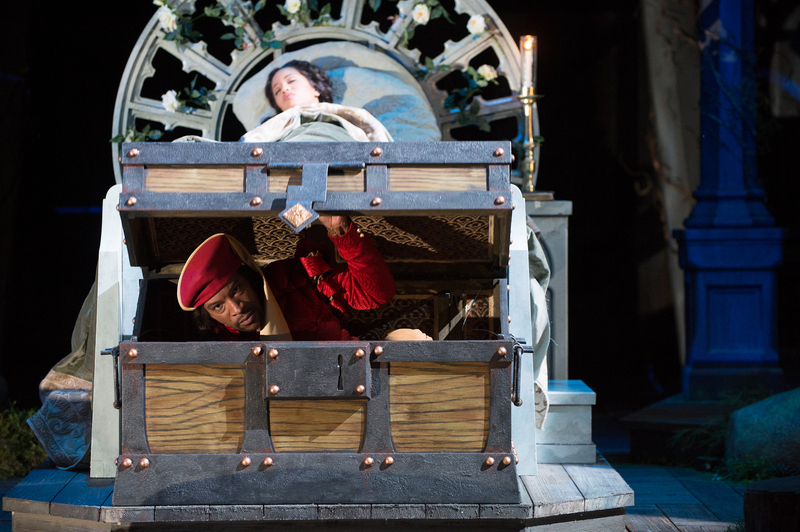 Cymbeline's language and plot are not as masterful as Shakespeare’s greatest, but the Oregon Shakespeare Festival made sure to give it as much justice as they did Troilus and Cressida last year. As with most of Shakespeare, there are numerous plots that run throughout the course of the play, but most prominent is the romance between the ancient British princess Imogen and her lover, a court-raised boy named Posthumus Leonatus (after his father, who died in war). Posthumus’ Roman friend, under a bet, fakes evidence proving that he seduced Imogen, causing war to break out between the two nations. In the meantime, Imogen disguises herself as a man (as women were wont to do in Shakespearean comedies) and finds herself in the company of a hunter and his adopted sons…who happen to be the British king’s eldest two sons, lost long ago at sea. OSF’s Cymbeline stayed roughly within Shakespeare’s time period, odd for the festival, but played fast and loose with accuracy: The Romans dressed like Venetians and used Italian accents, while some of the British wore elf ears. Though the costumes helped distinguish groups of characters from each other, they were certainly not as inspired as other OSF productions I had seen. However, the more typical setting worked for the obscure play. Cymbeline should be seen just for the fact that hardly anyone does it, but OSF’s production of it is more than just sheer novelty. It is an entertaining romp through the woods that allows us to experience a rarely seen side of Shakespeare’s work. My suggestion: Leave the full plot summary at home and enjoy getting shocked by the play’s twists and turns.